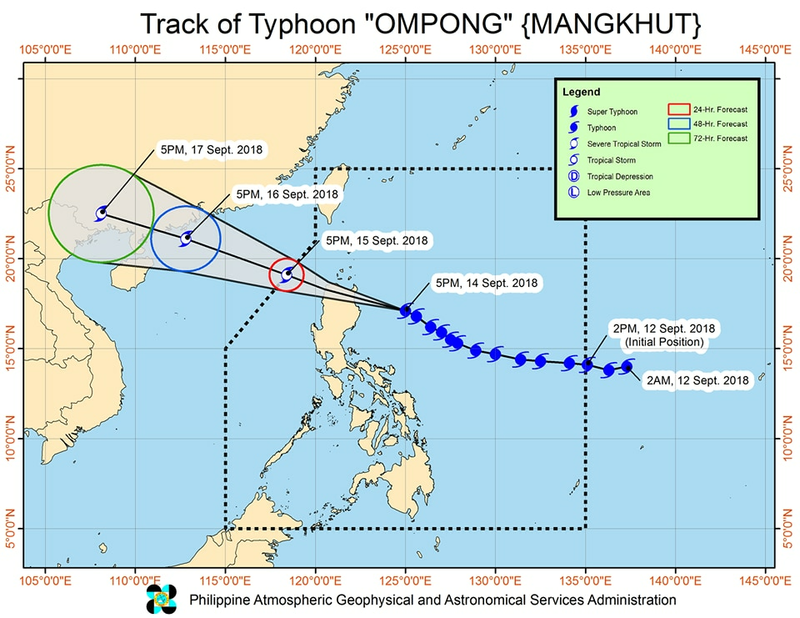 MANILA- Four areas were placed under the second highest tropical cyclone warning signal Friday night, as Typhoon Ompong (international name: Mangkhut) nears landfall. State weather bureau PAGASA placed Cagayan, northern Isabela, Apayao, and Abra under Tropical Cyclone Warning Signal No. 4 as winds of 171 kph to 220 kph are expected to be felt within the next 12 hours. The strongest typhoon to hit the Philippines this year, Ompong maintained its speed of 30 kph and continues to move northwest. At 7 p.m., the center of the typhoon was spotted at 260 kilometers east, northeast of Casiguran, Aurora. It continues to pack maximum sustained winds of 205 kph with 255 kph gusts. Storm surges of up to 6 meters above mean sea level are possible in coastal areas in Cagayan and Ilocos Norte early Satuday morning, while storm surges up to 2 meters above mean sea level are possible in Isabela and Ilocos Sur, PAGASA said. Ompong is expected to exit the Philippine area of responsibility by Sunday afternoon.